On October 1, 1862, special Bavarian stamps, for the collection of postage due on insufficiently paid letters, were issued. The 3 Kr. postage due stamps were imperforate and printed in black on unwatermarked paper with silk security threads. The stamp is shown in the image above (Mi. Portomarken #1, Sc. #J1). Beginning in 1870, 1 Kr. and 3 Kr. Postage Due stamps were issued. They were printed in black on lozenge watermarked paper without silk security threads, and they were perforated 11 1/2. Stamps printed on paper with the narrow lozenge watermark are (Mi. Portomarken #2X-3X, Sc. #J2a-3a). Stamps printed on paper with the wide lozenge watermark are (Mi. Portomarken #2Y-3Y, Sc. #J2-3). In 1876, new postage due stamps were issued, due to the change-over from the Bavarian to the German Imperial currency. The 3 Pf., 5 Pf., and 10 Pf. embossed arms design Bavarian stamps, shown above, were issued as postage due stamps. The designs were the same as the embossed-arm-type definitives currently in use, but the color of the three stamps was made gray, in order to avoid confusion with the regular definitive postage stamps of the time. 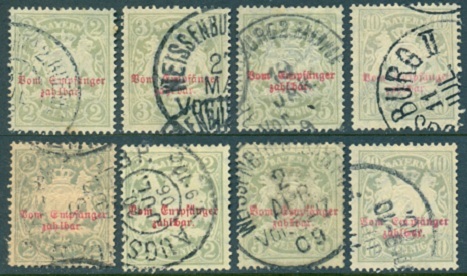 The stamps were overprinted "Vom Empfänger zahlbar" or "Payable upon receipt" in red. There are two types of the overprint (16.5 mm wide and 17.5 mm wide), and the prices are the same for each. These stamps were perforated 11 1/2 and were printed on paper with the horizontal wavy lines far apart watermark (Mi. Portomarken #4-6, Sc. #J4-6). Between 1882 and 1885, the 3 Pf., 5 Pf., and 10 Pf. postage due stamps were again issued, but they were printed on paper with the vertical wavy lines close together watermark. Otherwise, their attributes are exactly the same. The 10 Pf. is shown in the scan above (Mi. Portomarken #9, Sc. #J9). The 3 Pf. and 5 Pf., with this watermark, are very scarce (Mi. Portomarken #7-8, Sc. #J7-8). The four postage due stamps, in 2 Pf., 3 Pf., 5 Pf., and 10 Pf. denominations, at the top of the image above, were issued between 1888 and 1903. In line with the changes to the embossed arms definitive postage stamps, the new postage due stamps were perforated 14 1/2 and were printed on (rose) toned paper with the horizontal wavy lines close together watermark. The same four Bavarian stamps were re-issued in 1903 on white paper, as shown at the bottom of the image above. There are two varieties of the perforations on the 1903 issue -- being large perforation holes and small perforation holes. The papers do not show up well in my scan above, but the four stamps at the top ARE on rose colored paper (Mi. Portomarken #10x-13x, Sc. #J10a-13a), and the four stamps at the bottom ARE on white paper (Mi. Portomarken #10y-13y, Sc. #J10-13). In September of 1903, a small quantity of 3 Pf. postage due stamps, in yellowish gray, were overprinted and re-valued with a red "2" in each corner. This printing was not released for use, and the six known examples of these stamps are exceedingly RARE (Mi. Portomarken #I, Sc. #J14) -- priced in the 2016 Scott Classic Specialized catalog at $150,000 each!